Matrix Business Office IP Phone Systems meet the varied communication requirements of customers from diverse industries, businesses and institutions. The product portfolio of IP Phones has wide range from Business, Executive to Premium IP Phones. 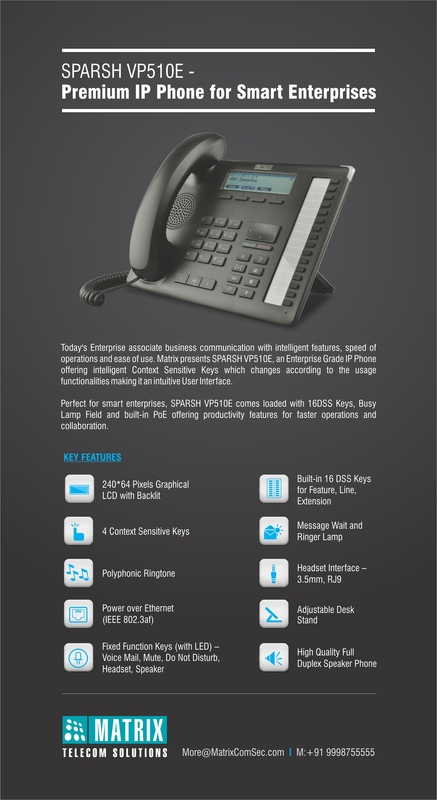 It includes user-friendly, full-featured IP Phones to meet the needs of an enterprise. SPARSH VP510E is one the Premium IP Phone with pre-loaded all VOIP Phone Handset features to serve the purpose of Business Office Phone. SPARSH VP510E sets the benchmark for quality performance with elegant design and crystal clear voice. SPARSH VP510E features a LCD Graphical Display, Context Sensitive Keys, Direct Station Selection (DSS) Keys, 32 Keys Expansion Module, Headset Connectivity, High Quality Full Duplex Speaker Phone and High Definition Audio Quality. SPARSH VP510E acts as a face of your communication system by delivering advance features such as Multiple Call Line Appearance, Context Sensitive Soft Keys, Busy Lamp Field, Voice Mail, Speed Dial and Corporate Directory.